Some guys just run out of options. This person has developed a NW6 pattern over the years. 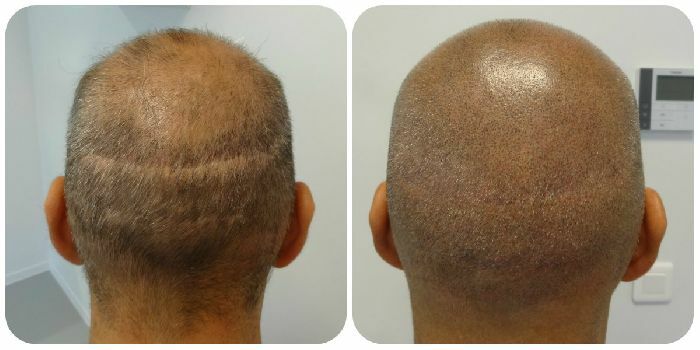 The transplanted area is too large and therefore the hair restoration did not produce a natural looking result. Making things worse is that he is now unable to shave his head due to the huge linear scar left by his FUT surgery. 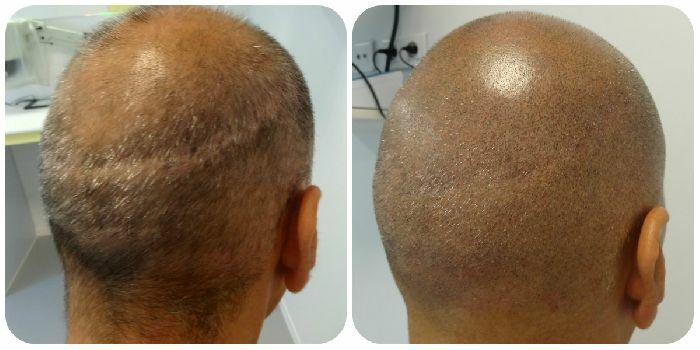 Our SMP department at Prohairclinic spend many hours and 3 seperate sessions in order to provide for a natural looking shaven look with the scar improved to the best of our capabilities. We are allowed to show only pictures from the rear side. From the photos it looks very good,SMP usually does look good in photos. What I want to know is how many times a day would he need to shave,say if his hair grows fast. I can shave my head in the morning,then by mid afternoon,I’ve got hair showing,probally a millimeter or two. I’m white,I’ve got hairloss at the front,I like the idea of SMP,but the idea of tattoo’d hair against remaining hair showing,could make it very noticeable - right or wrong please let me know. I do occassionally see a coloured man who seems to of had SMP,or have I noticed because I know of it?? I can see his hairloss then shiny SMP I think. Then for all I know maybe its fashionable. When you state that your hair grows 2 mm in a day than you may have the fastest growing hair in the world. It is generally acceped that hair grows about 1 cm a months, or about 0.03 mm a day. We tell our clients to shave every 2 or 3 days, and that is fine from what we see and hear. I can not comment on your situation since we have not seen you nor have seen any pictures. Okay perhaps not 1-2 millimeters,but after several hours you can see the hairs darker and you can feel hair,no longer smooth.1cm a month as got to be wrong.I shave my head every morning.There again I’m not trying to sell tattoo on someone’s head!